I have Legos on my mind. 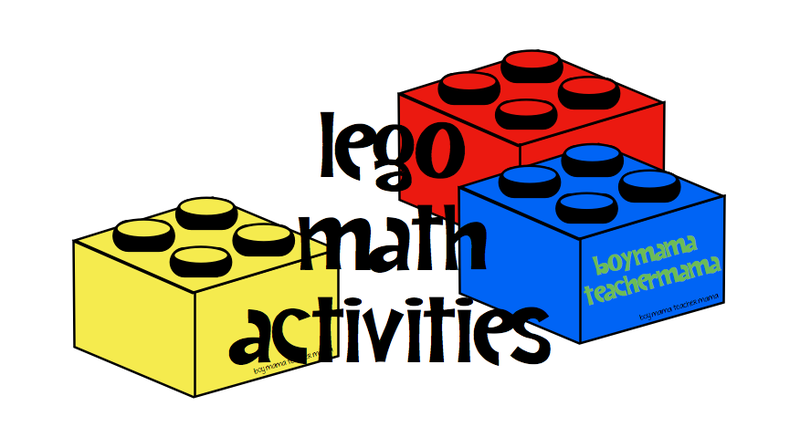 I am supposed to be preparing to teach a week long Lego Robotics class, but instead was inspired (by my son’s report card) to create some fun math games for us to play this summer. 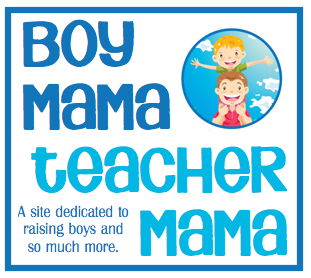 He loves Legos, but is not a fan of math so I am hoping this will help…. To do this activity, print out several copies of the bricks page and cut them out. Ask your child to create a pattern using the paper bricks. After a few practice patterns, have your child or student color in the bricks on the page to match a pattern he created. Grouping 5s and 10s is an important skill for early learners. It helps with adding, subtracting and place value among other things. This game helps with creating and counting groups of 5s. Get a bin of Legos (again preferably the same size) and have your child grab a handful of Legos and place it on the green side of the Lego Grab and Group Mat (left). Then have your child or student, group the Legos he grabbed into groups of 5s and place each group on one of the colored rectangles on the Grab and Group Page. Once all the Legos are grouped, have your child count by 5s (and then by 1s if necessary) to determine how many bricks he grabbed. Then record the answer on the Grab and Group recording sheet. The activity packet also includes the same activity for grouping by 10s. 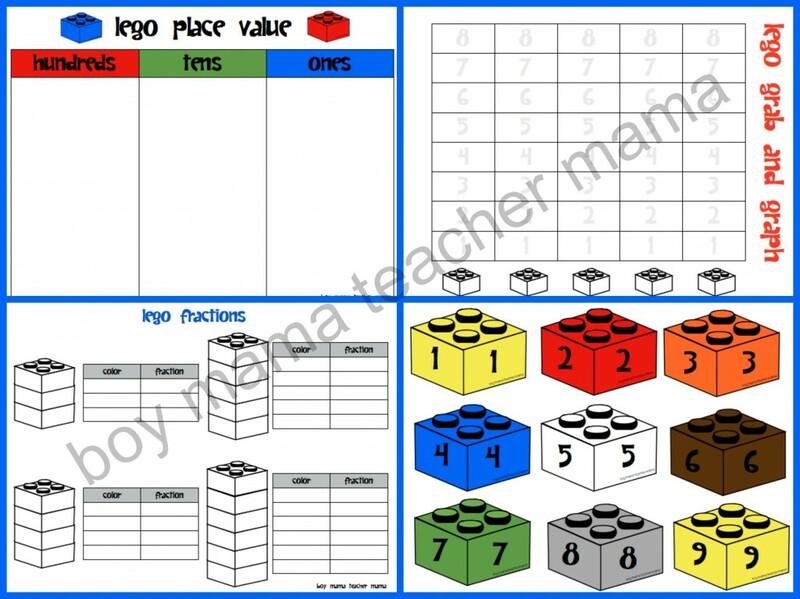 (Top Left) Lego Place Value Game: This is commonly played Place Value Game in the classroom, but instead of using Place Value blocks, use Legos. Again, we used the bricks with 4 dots on top. To begin, the first player rolls a die. He places that many Legos on the 1s side of the mat. In this example, the first player rolled a 4 and placed 4 bricks in the ones column, Then the next player rolls. This player rolled a 5 and added 5 bricks (or ones) to the ones column. The first player rolls again and gets a 2. 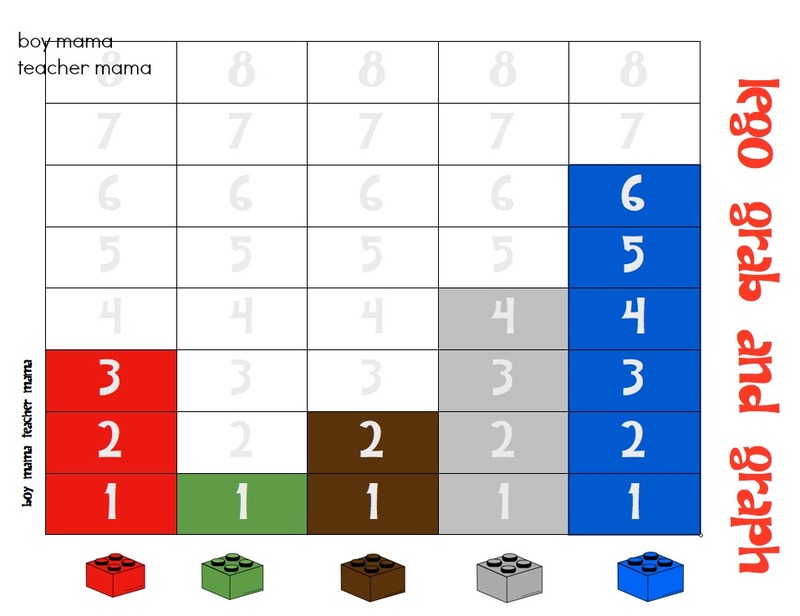 Knowing that there cannot be 10 ones in the ones column, the player trades 10 of the ones for a ten (ten Legos stacked), puts that ten in the tens column and leaves the remaining 1 in the ones place. The game continues until the partners get to 50. Race to 50: Each player has their own board and first one to 50 wins. Backwards: Once at 50 play backwards by breaking apart tens as you subtract. Number Cards: Instead of rolling the die, use number cards. (Top Right) Lego Grab and Graph: Similar to Lego Grab and Group, the student grabs a handful of bricks and graphs the results of his grab by color. 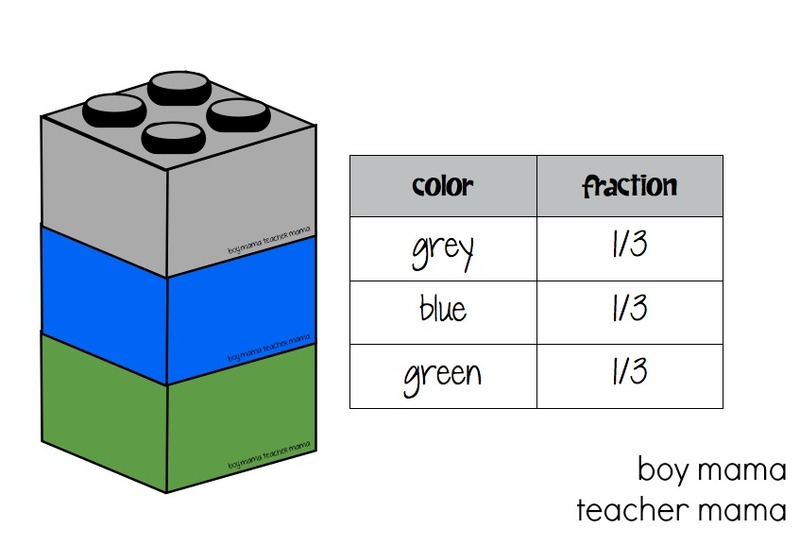 (Bottom Left) Lego Fractions: Color each of the bricks in each stack different colors and then use the recording sheet to state what the fraction of each color is. (Bottom Right) Lego Number Cards: Print a few copies of the Lego Number cards to play games like Go Fish, Memory, Old Maid and Snap! Cards can also be used to practice math facts, counting, ordering numbers, odds and evens, greater than/less than and more. Thank you for linking up to the Lego Challenges.